Many of you already follow my wife's blog, and therefore you already know that she got herself a 2015 Indian Scout. Or perhaps best clarified, Indian Motorcycle International, LLC, a division of Polaris Industries, Inc., loaned her one of their pre-production, media-edition, 2015 Indian Scouts, for at least two months. I make that clarification, because apparently, these pre-production, media-edition bikes are not exactly what will be delivered to buyers. I'm not aware of all the differences, but am told that among them is that actual Scouts will have adjustable foot controls for shorter/longer legs, and greater fuel range (I'm not certain what they'll do to increase that). But for all intents and purposes, she's got an honest to goodness 2015 Indian Scout, for free, for at least two months, and more importantly, she's been saying she's going to get one going back to last August. As the husband in all this, it's been quite an observation. Sash was at the previous Sturgis Motorcycle Rally the second the bike was unveiled to the public. She had acquired a rather coveted media pass into Indian's "Reveal" event. She got to chat with some big media names in the motorcycle industry, like Peter Jones of Cycle World, John Rogue of Bikernet, Cyril Huze of Cyril Huze, to name a few. But she also got to meet executives at Indian. It took a lot of follow-ups, a lot of persistence, along with demonstrating that we're good at blogging and social media, have a decent sized following, and are committed to working within the motorcycle industry. 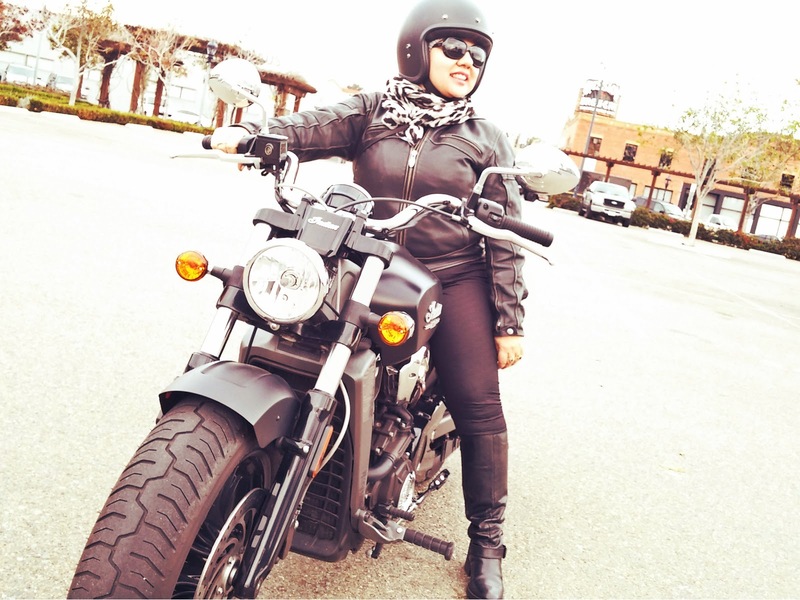 We submitted a written proposal, attended events where Indian executives would be, and it also helped that Sash and I had written reviews of the new Indian Scout on Biker News Online and and Women Riders Now. I mention this because a lot of people have asked us how it is that Indian Motorcycles would loan one of their bikes to Sash for a couple of months, when most media people only get them for a week or less. Well, persistence. A positive enthusiasm for the Scout. Being sashtastic. Won't take no for an answer. Being a woman. The last part has to do with Indian Motorcycles wanting to get more women riders over to their camp. There's also a story about her father. Sash remembers him telling her that he had always wanted an Indian Scout. He had told her about the legacy of the Scout. Considering he was a full-blooded American Indian, it seemed like a fitting bike. This was during the late 1960s and 1970s, and by then, the old Scout 101s were hard to come by. But this isn't simply a story of a girl wanting to honor her father, or gain his approval through the afterlife. She really digs this motorcycle! Did I mention the review she wrote for Women Rider's Now? And now with 35,000+ miles of riding across the country for nearly two years, as a newbie rider, she's ready to settle into a long-term bike. That's what the 2015 Indian Scout means for her. But I'm really just proud of her persistence and for believing that she'll make the impossible happen. This new website will also detail the impact Sash's father had on her new-found motorcycling passion. She'll be riding the Scout to various places of her troubled youth, reconciling the past, while seated on the bike her father always wanted. That's awesome. I'm going to head over there now and check it out. btw, I think Indian has a winner with the Scout. Polaris should just sign it over to Sash.....having an Indian on an Indian would be great PR, but I'm sure Sash has been pointing that out to them. That little gal is pretty persuasive. The Scout looks like a great bike. A friend of mine who has been riding since the mid-50s is even thinking of getting one (though he won't admit it). Any road trips planned with the demo bike? Kinda depends on how long we get to have the Scout. Right now, while we're wintering in San Diego, we actually have a client here we've committed to, so we're not going to leave until we've finished with them. But we do plan to do some weekend-overnighters. I remember checking out the Indian Chief (?) when I first started riding. It was a little left sided heavy, but it was a nice stern bike. For my height it was the wrong bike as a newbie, but still has been a fave of mine with an old school feel and history. Looking forward to her end of trial tales on the bike. The Scout seems like a bike that may make a difference with shorter people. I think it is pretty damn cool she was loaned the Scout for a few months. She worked heard to get use of the bike and I am sure she's going to love putting some miles on it. Great for her. It's a gorgeous bike.